American CryoStem Corporation is one of the largest commercial personal tissue banks globally, focused exclusively on the processing and storage of adipose tissue and the regenerative cells the tissue contains. The China launch activities are in support of the Company's previously announced licensing and supply agreement with Baoxin, under which Baoxin will pay the Company a minimum annual guarantee against a fixed fee per process and purchase certain necessary consumables from CRYO required for the collection, processing and storage of the collected adipose tissue. Under the terms of the Agreements signed in Fiscal 2017, CRYO invested in and currently holds five percent (5%) of Baoxin shares. 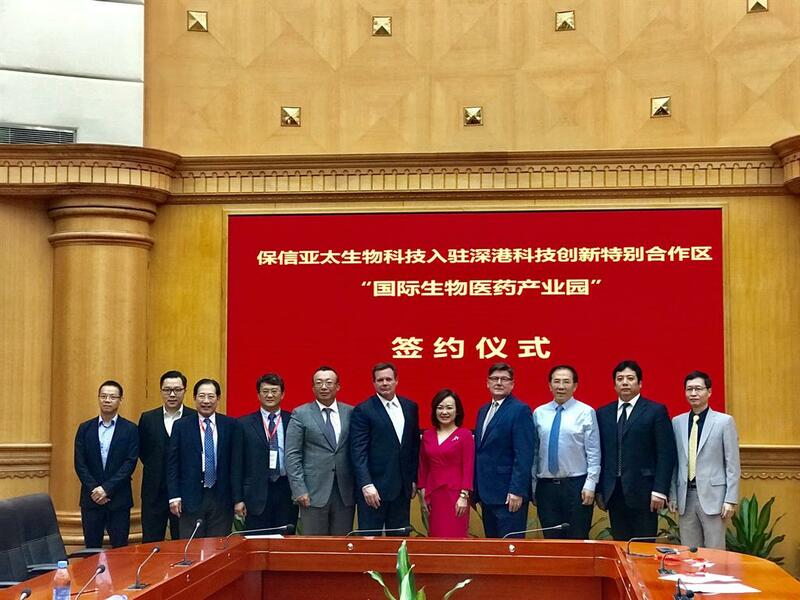 Additionally, Mr. Arnone and Mr. Dudzinski were elected to serve as Directors of Baoxin during their visit to Shenzhen, China. "We were very impressed with the Baoxin, ATGRAFTTM marketing program and work ethic and would like to congratulate Baoxin's management and marketing staff for a very impressive and effective launch tour," commented John Arnone, CEO, "the professionalism and interest generated in the ATGRAFTTM product prior to our arrival contributed greatly to the successful presentation at each hospital. We were also impressed by the organization and scale of the facilities we visited, each facility provides a wide range of cosmetic, aesthetic, and plastic surgical services in a single facility of ten to thirty thousand square meters, these are large facilities located in very large cities with heavy patient flow." Anthony Dudzinski, COO commented "The Chinese aesthetic, cosmetic and plastic surgery hospital facilities in China are organized differently than the way these services are delivered in the US. Each hospital facility provides every cosmetic option for a patient from surgical augmentations to cosmetic dentistry. We believe that this organization style is perfectly designed to rapidly expand Baoxin's success with the ATGRAFTTM products and allow the Chinese to prepare for the future of regenerative and cellular therapies. Further, management believes that China may become one of the largest markets in the world for tissue transfer and regenerative medicine." American CryoStem Corporation (OTC PINK: CRYO); founded in 2008, is a biotechnology pioneer, standardizing adipose tissue (fat) derived technologies (Adult Stem Cells) for the fields of Regenerative and Personalized Medicine. The Company operates a state-of-art, FDA-registered, laboratory in New Jersey and licensed laboratories in Hong Kong, Bangkok, Thailand, China and Tokyo, Japan, which operate on our proprietary platform, dedicated to the collection, processing, bio-banking, culturing and differentiation of adipose tissue and adipose derived stem cells (ADSCs) for current or future use in regenerative medicine. CRYO maintains a strategic portfolio of intellectual property (IP) that surrounds our proprietary technology which supports a growing pipeline of stem cell applications and biologic products. We are leveraging our platform and a developed product portfolio to create a global footprint of licensed laboratory affiliates, domestic and international physicians networks and research organizations who purchase tissue collection, processing and storage consumables from CRYO. Our laboratory stem cell bank/line products are characterized adult human Mesenchymal Stem Cell (MSC's) derived from adipose tissue that work in conjunction with our patented (non-animal) medium lines. The Company's R&D efforts are focused on university and private collaborations to discover, develop and commercialize ADSC therapies by utilizing our standardized collection-processing-storage methodology and laboratory products combined with synergistic technologies to create jointly developed regenerative medicine applications and intellectual property.